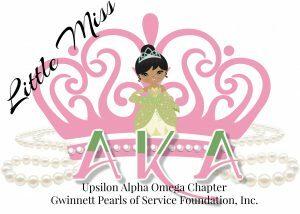 Little Miss AKA @ Gwinnett Pearls of Service Foundation, Inc. The Little Miss AKA pageant is the culmination of a series of cultural, educational and fundraising events for young girls ages 7 to 10 years old. This AKA signature program promotes and cultivates in the young girls’ etiquette, elegance, and poise. The service organization of Alpha Kappa Alpha Sorority, Upsilon Alpha Omega Chapter also provides workshops for the talented young girls from the metro Atlanta community. Their months of dedicated effort culminate in an elegant pageant held in the spring of odd numbered years. Since the pageant’s inception in 2006, UAO along with Gwinnett Pearls of Service Foundation, Incorporated has used the program as a means of fundraising for awarding scholarships dollars to young women and men for their scholastic achievement and community service. Funding for the scholarships come from patron donations and solicitations. Join UAO and GPS for the culmination of the Little Miss AKA experience.